You might hear us talk about the lack of help and understanding we get from the majority of doctors. There is a handful of doctors who actively work, on our behalf, to get to the bottom of this complex illness. The first week on the new supplements was really not good. I can’t begin to explain the washed out, sluggish feelish. Everything was a battle; to sit up, to move my arms to get food from my plate into my mouth, to chew and swallow… Wowzers! All of these supplements support the reduction of fatigue but it felt like the opposite was happening. Perhaps my body has forgotten how to function properly and so couldn’t process the supplements as it should have been able to. To cut a long story short I came off the supplements. 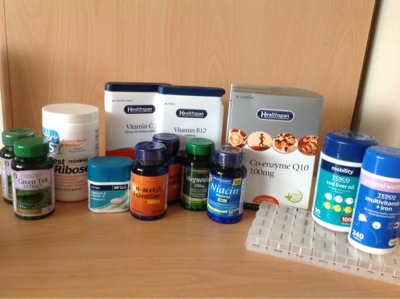 I gave it more than four long weeks, well over £200 and a bucket full of effort and determination but it became clear that it was the supplements that were exacerbating the fatigue, visual disturbances, malaise, everything! At some point I may reintroduce some of the supplements to try to determine whether it was just one of them causing the problems. It highlights how what may work for one sufferer may not work for another. We are all affected by this plague in different ways with no definitive treatment or road to recovery. (I did not buy Dr Myhill’s test kit or the package of supplements from her website. It was much cheaper, but still very expensive, to buy the supplements separately from Holland and Barrett, Healthspan or other online stores. Was just wondering how your night out with your friends went on Saturday – I hope you are not suffering too much pay back and that the night went well.